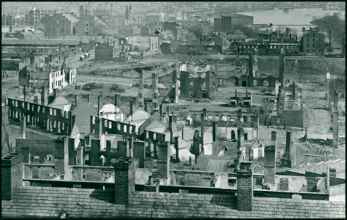 No one in either the North or South thought the war would run more than a few months, or that it would cause the destruction, turmoil, or loss of life that it did over the course of four bloody years. Many civilians in the North were affected by the war primarily through shortages of certain goods, and the absence of fathers, sons, and husbands to help run farms, businesses, and households. In contrast, daily life for people in the South could be a terrible struggle. 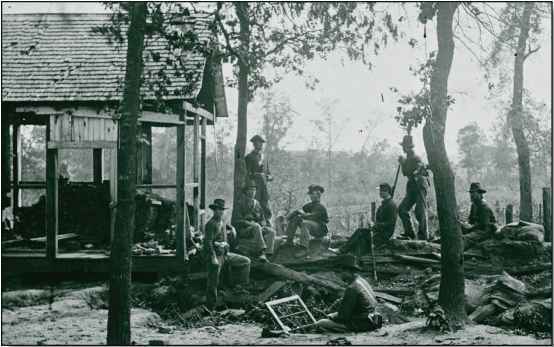 The vast majority of battles were fought in the Southern states, and thousands of troops moved through large areas of the South—troops that needed food, shelter, and supplies that were provided at the expense of Southern civilians. 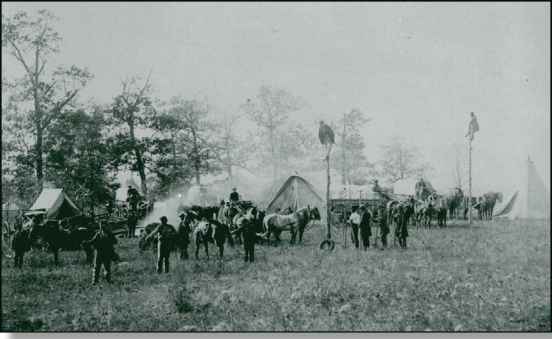 As the war years went by, more and more of the South was retaken by the Union, and the Union policy of "total war" (completely destroying an enemy's means of fighting a war) meant that many parts of the South were completely ravaged: crops ruined, livestock slaughtered, and fields made untillable. Burned out section of Richmond, Virginia. Federal pickets outside the city of Atlanta, Georgia. The biggest problem for people in the South was the shortage of food. This was a huge problem in many Southern cities, especially those that the Union considered strategic. Union troops would blockade these cities, not allowing supplies of any kind, including food, to reach the citizens. 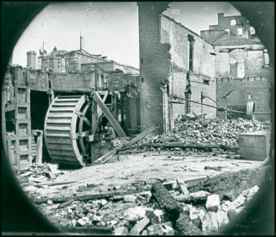 The people of Richmond, Virginia, for example, suffered from such severe food shortages that in the spring of 1863, women began rioting in what became known as the Richmond Bread Riots—and this was a full two years before the official end of the war. Another part of the problem was that most of the land in the South had been traditionally devoted to growing cotton, not food crops. James River and Kanawha Canal near the Haxall Flour Mills in Richmond, Virginia. some temporary fabric shortages because of the loss of Southern cotton, Southern women used up every kind of fabric they could, both to help the war effort, and to clothe themselves and their families. Many Southern women learned how to sew, knit, and spin—often for the first time, since wealthy families had always relied on slaves to do this kind of work. "Homespun" dresses—dresses made from cotton spun and sewed by hand—became very common. In both the North and the South, many women discovered that the war allowed them to have roles outside their traditional ones as mothers, daughters, and wives. Women became active in supporting the war effort in many different ways: participating in Ladies' Aid Societies, nursing, even acting as spies, and, in a very few cases, disguising themselves as men and becoming soldiers. Many women took over traditionally male roles in their households, including overseeing plantations and farms and running businesses. What's more, many discovered that they both liked the responsibility and were very good at it. Despite the overwhelming hardships of life in wartime, people still had fun, held parties and dances, and lived their day-to-day lives as best they could. Minstrel shows were a popular form of live entertainment during the Civil War, as were live band concerts and traveling circuses. Children played with dolls and wooden toys, and played a new game that was becoming incredibly popular throughout the North and South: baseball. When the war officially ended in 1865, life in the re-United States was forever changed. Slaves who had never known independence were able to start their lives anew as free people. Southerners had to rebuild their homes, lives, and land, without the benefit of slave labor. Northerners had to readjust to a postwar economy and the influx of thousands of men who were returning to a workforce that wasn't ready for them. In addition, families had to adjust to being together again with men who had lived through experiences that were hard to bear and even harder to forget. 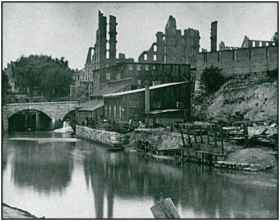 Ruins of a Southern paper mill with water wheel.